National Stroke Awareness Month. Healthy eating and exercise are contributors to stroke prevention. According to the National Stroke Association (stroke.org), physically active individuals have a 25% – 30% lower risk of stroke than less active individuals. 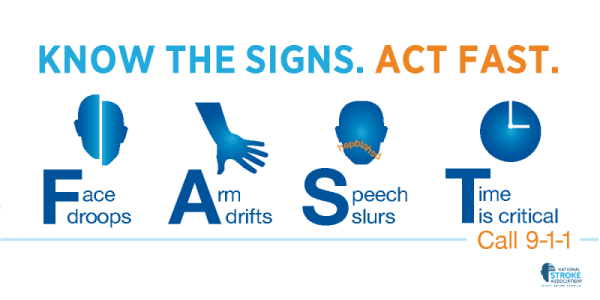 One of their biggest educational campaigns is FAST, teaching the world to know the symptoms of stroke and how to respond quickly to help save a life. *Face – By asking the person to smile you can tell immediately if one side of the face droops. *Arm – Ask the person to raise both arms. Observe to see if one arm drifts lower than the other. *Speech – Slurred speech is a symptom of stroke. Ask the person to repeat a single sentence. *Time – Call 911-Fast. Time may be the difference between life and death or even partial and full recovery. National Stroke Awareness Day was proclaimed in 1989 by President George H. W. Bush. It had been observed for many years before the proclamation. The Centers for Disease Control, the American Heart Association, World Stroke Campaign and many other have all participated in bringing education, research, and treatment on a global basis.